... This is at least what the Indians claim, and what can be read on the sign at the top, even though the GPS seems to be a little less optimistic (5,360m "only"). Still a fair climb : +1850m on some 40kms. Departure 6.30am for me as I'm dead slow, 8.30 for Pierre who catches up with me after only 25km just before the South Pullu checkpoint. No permit? Well, no... didn't think we needed one just for the pass (I didn't have one last summer). Passports ? Oops, left them in Leh... Hum, things don't look too good! After 1 hour negociating with the Sikh policeman on duty, and letting him try the tricycle, we eventally manage to talk him into letting us through. We set off again after a hearty plate of noodle soup and one more hour break spent talking with the 6 other cyclists who also attempt the climb today. Tarmac ends after a few kms. A military convoy of some 30 trucks offers us yet another forced break by the side of the road, not in the best setting of all (dust and exhaust fumes). The road slightly worsens, but the tricycle handles the obstacles remarkably well, even though the rear wheel looses traction a couple of times. We finally reach the top in the afternoon. 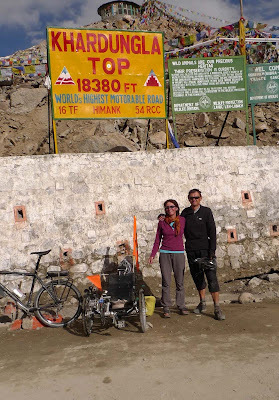 Traditionnal picture in front of the sign "world's highest motorable road - 18380ft (5606m)". Nice hot tea to warm up, and we're ready for the fun ride down back to Leh, though the first few kms are a bit rough. Then the last 30 kms of good tarmac feel great! Short break to retrieve the cards we left left as a "deposit" to our friend the Sikh policeman who takes the opportunity to play with the tricycle again. 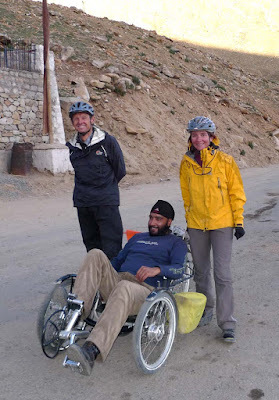 We arrive in Leh late in the day, tired but glad to have met the challenge, hands down.